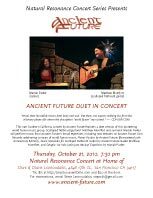 Thursday, October 21, 2010, 7:30 pm, Natural Resonance Concert Series Presents Ancient Future Duet featuring Matthew Montfort (scalloped fretboard guitar, Glissentar) and Mariah Parker (santur), Natural Resonance Concert Series, House Concert @ home of Steve & Diane Leonoudakis, San Francisco CA 94117. Tix: $15 online at Eventbrite and $20 at the door. Reservations email: Steve Leonoudakis at stepndi@gmail.com. The Natural Resonance program focuses on works making full use of the natural resonance of the scalloped fretboard guitar, Glissentar (11 string fretless guitar), and santur. Program information. 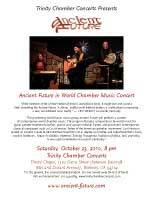 Saturday, October 23, 2010, 8 pm, Ancient Future in World Chamber Music Program featuring Matthew Montfort (scalloped fretboard guitar, Glissentar) Mariah Parker (Steinway grand piano, santur) and Ian Dogole (percussion), Trinity Chamber Concerts, Trinity Chapel, 2320 Dana Street between Bancroft Way & Durant Avenue, Berkeley, CA 94704. Tix: $15 General, $10 Senior/ Disabled/ Student. No one will be turned away for lack of funds. To reserve a ticket call 510-549-3864. The Trinity Chamber Concerts program focuses on world chamber music by Matthew Montfort, Mariah Parker and contemporary composers such as Egberto Gismonte and Lou Harrison. Program information. Wednesday, November 3, 2010, 7 pm, The Sonoma County Libraries Present Ancient Future In Concert Celtic Raga Program Featuring Matthew Montfort (scalloped fretboard guitar, Glissentar) with Ferhan Qureshi (tabla), Sonoma Valley Regional Library, 755 West Napa Street, Sonoma, CA 95476. Free admission. Info: Call Stephan Buffy at 707-996-5217. The Celtic Raga program includes a premier performance of a gat in Rag Kalyan by Matthew Montfort and a raga development treatment of the traditional Celtic tune, “Banish Misfortune.” Program information. To celebrate Ancient Future's fall concerts, for the week of October 19 through 26, the San Francisco Classical Voice is hosting a free mp3 of Mariah Parker's composition “Sangria,” from Seven Serenades for Scalloped Fretboard Guitar by Matthew Montfort. 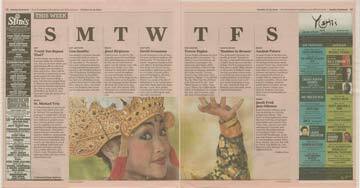 Much of this issue of the Ancient Future Times has to do with the classical music scene in the San Francisco Bay Area, so it would be a great oversight not mention an amazing local musical hero: pianist and composer Seth Montfort, the brother of Ancient Future leader Matthew Montfort. Seth Montfort manages to produce and perform classical music concerts of the highest caliber at The Composers' House in Guerneville, California, all on small amounts of money raised from local music lovers. If you send a tax deductible donation, please email seth@sfconcerto.org or call (707) 604-7600 or 7606 to inform him of your pledge.